I happen to believe that she's just one of those celebrities who really is just THAT nice to her fans. Can you imagine how many "weirdos" (As Sam Eagle would put it.) 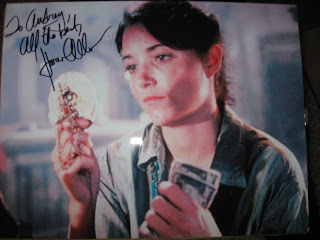 have probably written to her over the years, and she STILL does this for all her fans. For FREE. I also slipped in the chapter that I wrote about her for my "upcoming" book on action heroines. I couldn't help myself. As a little geek girl, you're always sort of naively doing things with the hope that somehow it will land you your "big break". I just have to take those chances, even when my brain tells me not to bother. 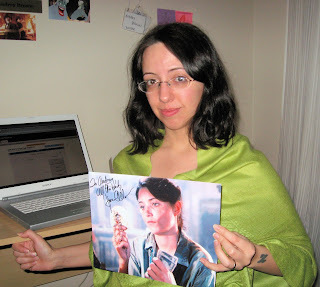 Here's me with my newly puffy face, groggily holding my awesome autograph.